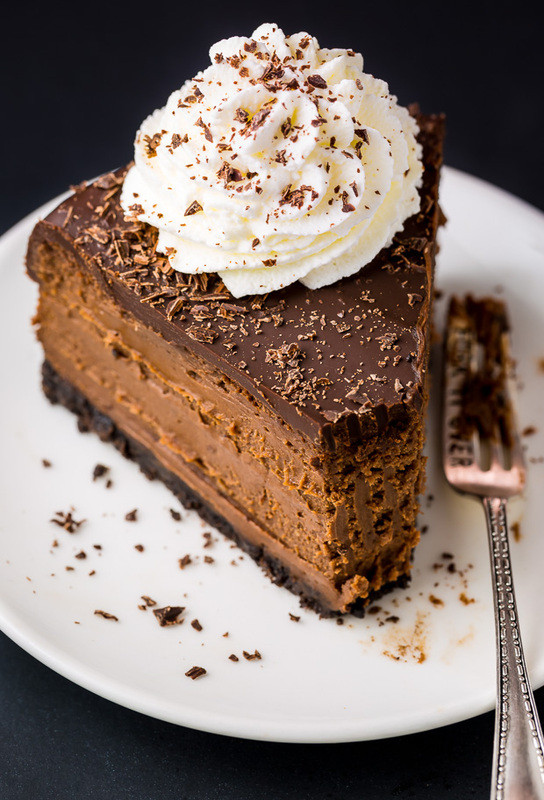 Rich and creamy Chocolate Mascarpone Cheesecake! 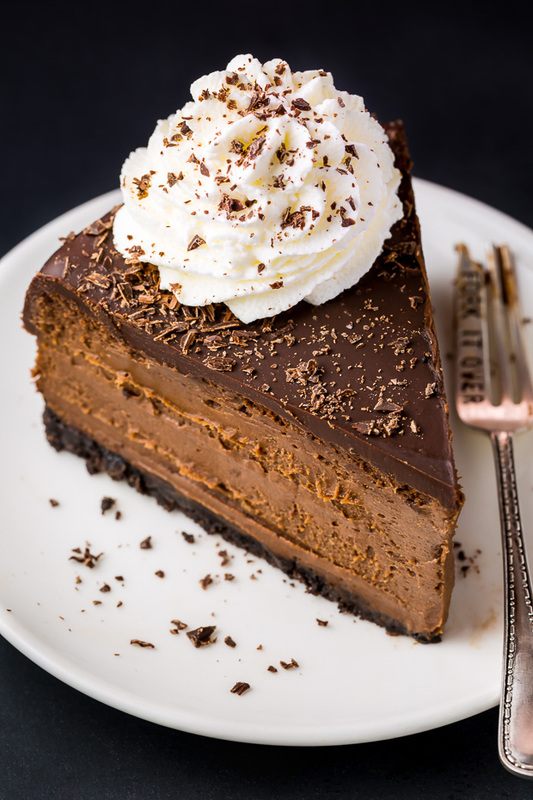 This decadent chocolate cheesecake features a chocolate cookie crust, a creamy chocolate mascarpone filling, and a chocolate ganache topping! Death by chocolate cheesecake anyone?! Holy smokes! 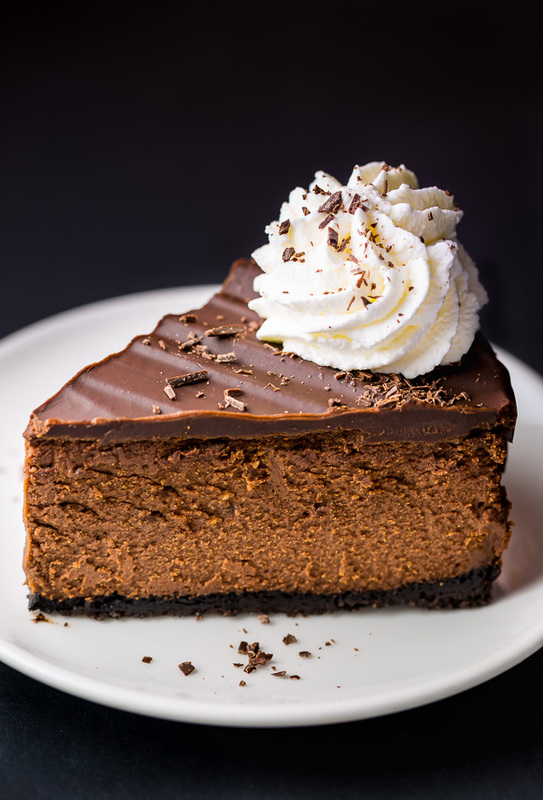 This chocolate cheesecake is going to rock your world. Want to know why? It’s simple: MASCARPONE CHEESE. It’s a total game changer! It’s luscious, creamy, and just a little bit tangy. ← Wait, don’t stop reading! If you’re put off by the tangy thing, let me ease your mind. The “tang” is very similar to sour cream or buttermilk. 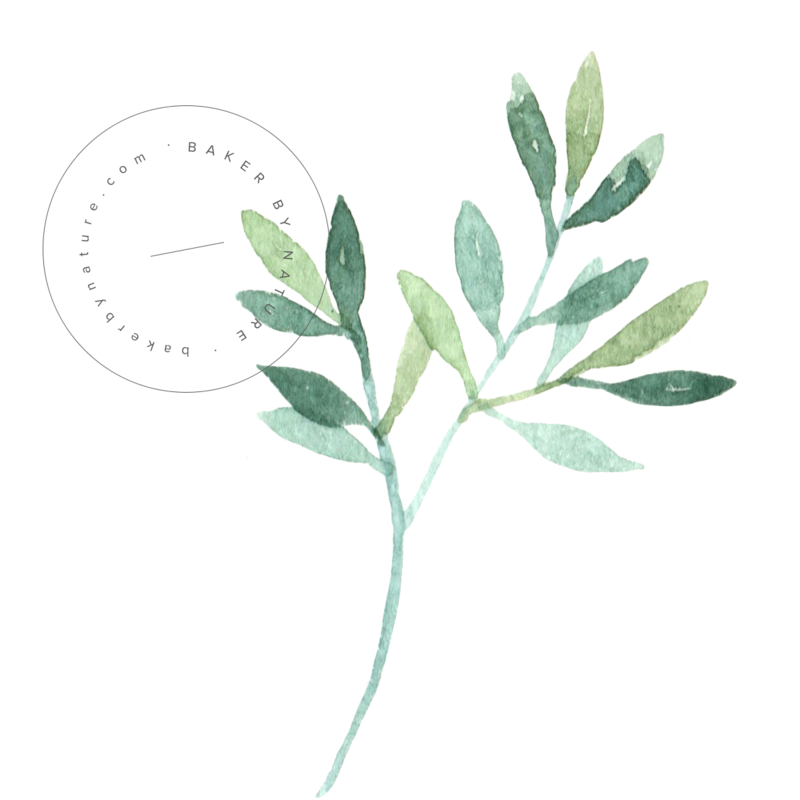 It’s subtle… delicate, really! But it does its job and it does it well. 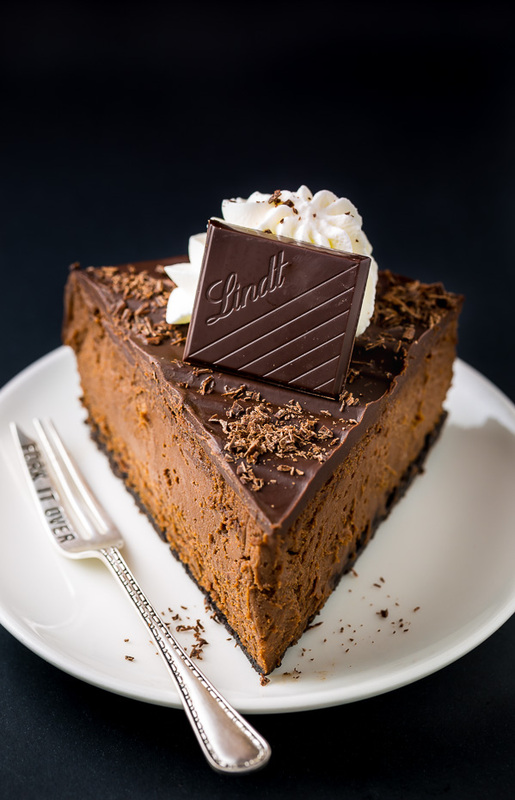 It balances out the sugar and chocolate which prevents the cheesecake from becoming cloyingly sweet. It creates a texture that’s so rich and creamy it feels like magic. Each bite melts in your mouth and leaves you wanting more. It’s nirvana! 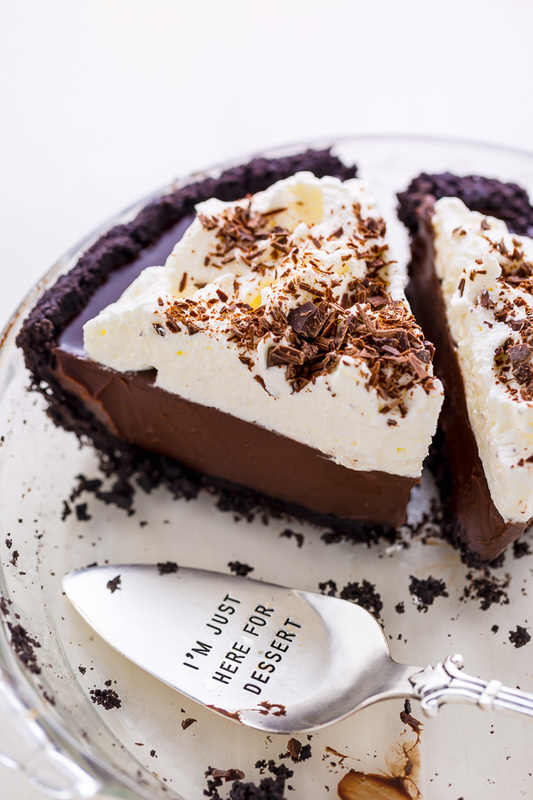 To make the chocolate cookie crust you will need two ingredients: melted butter and Oreo cookies. Do not remove the cream from the center of the cookies. Simply toss the whole cookies into a blender or food processor and pulverize them into small crumbs. You’ll want to scrape the edges of the food processor a few times during the pulsing to ensure there are no large chunks. This recipe requires a springform pan. If you don’t already own one and need a good place to start, feel free to click here and check out the one I’ve been using for years. The cream cheese and mascarpone cheese MUST be very soft before you begin assembling this recipe. I typically leave these ingredients out on the counter for at least two hours before I plan on baking. You should also bring your eggs and milk to room temperature. Batters made with cold ingredients don’t come together smoothly. As for the chocolate, it will need to be melted and slightly cooled; 10 minutes or so should do the job. I recommend using a quality chocolate brand you know tastes great and melts well. I used Lindt 70% chocolate, but use any brand you know and trust. I do not recommend using chocolate chips! This recipe calls for a water bath. If you’re unfamiliar with the water bath process, read on! A water bath is simply the term bakers use when they place a baking pan (in this case, our cheesecake pan) into a larger pan that’s been filled partially with hot water. Taking this extra step helps insulate the pan from direct heat on all sides while it bakes. The water bath method helps your cheesecake bake gently, ensuring the finished product doesn’t burn, curdle, or crack. It also helps the cheesecake maintain its silky smooth texture. When it comes to choosing a pan for your water bath, choose one that is as tall as the cheesecake pan and large enough to leave a few inches between the cheesecake pan and the outer rim – you want enough room for the water to circulate easily. When you’re ready to make your water bath, here’s what you do: Adjust an oven rack to the middle position. Preheat oven to called for temperature. When the oven is preheated, carefully (using an oven mitt) pull out the middle rack and place your large pan on it, fill the pan with about two inches of hot water, then place the filled cheesecake pan in the center of the water bath. Slowly slide the rack back to its full inserted position, close the door, and bake the cheesecake according to instructions. If you’re using a spring form pan it’s essential to wrap the pan in MULTIPLE LAYERS of heavy-duty tin foil to avoid water seeping in. I wrap my pan from every angle pressing the foil in, up, and around to prevent a soggy crust. You’re going to leave the cheesecake pan in the water bath, even after you turn off the oven. You’ll take the cheesecake out of the water bath once it has been removed from the oven. Most importantly, you MUST chill the cheesecake in the fridge for 6 hours (or overnight) before slicing and serving. If you try to slice into it before it’s cooled, it will be too soft and mushy. Yuck! 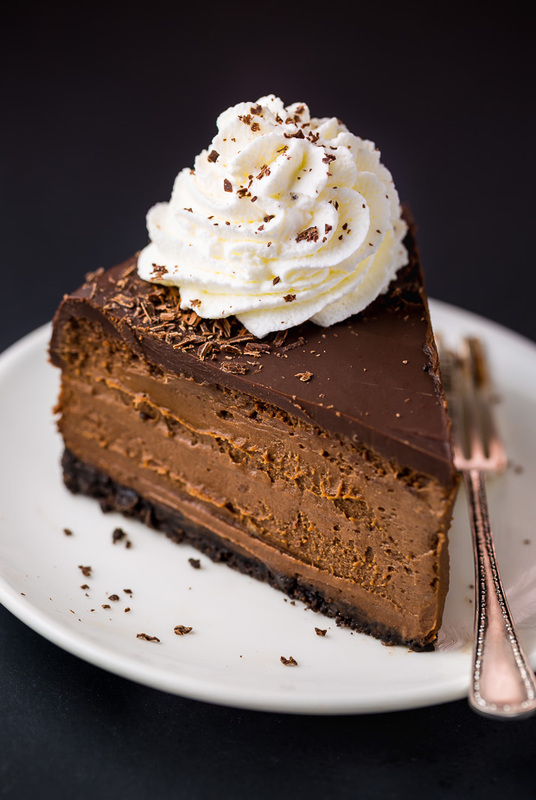 Rich and Creamy Chocolate Mascarpone Cheesecake! Preheat oven to 325 degrees (F). Wrap a 9" spring form pan VERY well in multiple layers of heavy-duty tin foil; lightly grease the pan with non-stick spray; set aside. Add the Oreos to the body of a blender or food processor and pulse until the cookies are fine crumbs. Stir in the melted butter, mixing well to combine. Dump the mixture into the prepared pan, pressing the crust down firmly and slightly up the sides. Set aside. Beat cream cheese and mascarpone cheese in a blender until completely smooth. Beat in the milk. Add in the eggs, egg yolks, and sugar; pulse until well combined. Add cocoa powder and vanilla and pulse for another 30 seconds, or until cocoa powder has completely disappeared into the batter. Don't over mix! Using a rubber spatula, fold in chocolate, stirring gently until combined. Place the springform pan in a large baking pan (with high sides) and fill the pan with about two inches of hot water; this is your water bath (see post if you need more information on this). Place cheesecake in preheated oven and bake for 1 hour and 20 minutes. Turn the oven off and let the cheesecake sit for 45 minutes, inside the oven, with the door shut. The cheesecake should be still slightly wiggly in the center. Remove from oven and gently run a knife around the edge of the cake, loosening any bits that may have gotten stuck while baking. Allow cheesecake to rest on the counter for 30 minutes before covering with plastic wrap and refrigerating for at least 6 hours. When ready to serve pour the ganache on top of the uncut cheesecake and place it back in the fridge for 15 minutes (this will help the ganache set). Slice, top with a dollop of whipped cream, and serve! 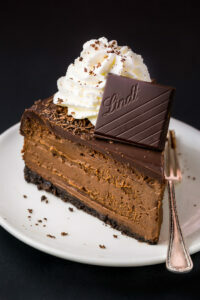 Oh my, I would love to have a big slice of that absolutely decadent looking cheesecake! Thanks for sharing the recipe! OH EVERYTHING HOLY I NEED THIS CAKE. It looks so freaking delicious! Holy delicious. Sometimes when I’m feeling down, I just need a heart dose of chocolate. 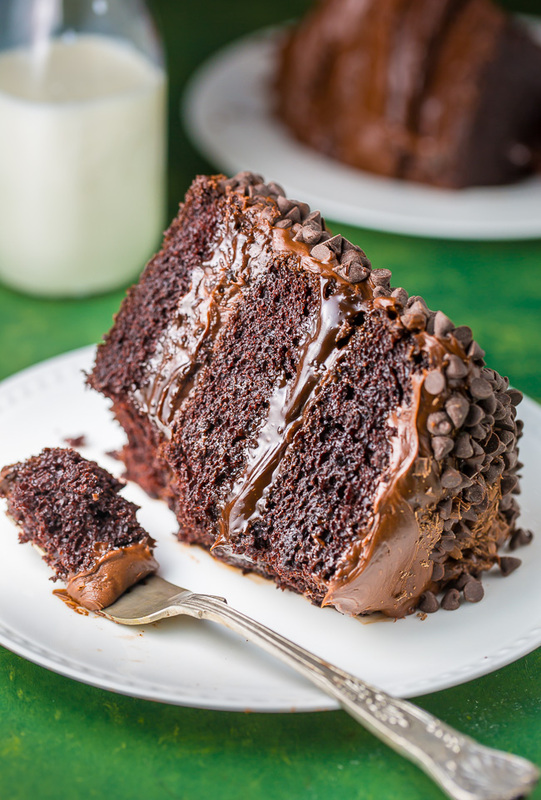 And by the looks of things, this cake is EXACTLY what the doctor ordered. Amazing! This cheesecake looks so, so good!! Can I use more Cream Cheese instead of Marcarpone Cheese? What can I use as a heavy cream substitute? Whoa, this cheesecake looks incredible! Now I want a slice of cheesecake for lunch! Hi Agata. I just checked and the milk is listed in the recipe and the method. 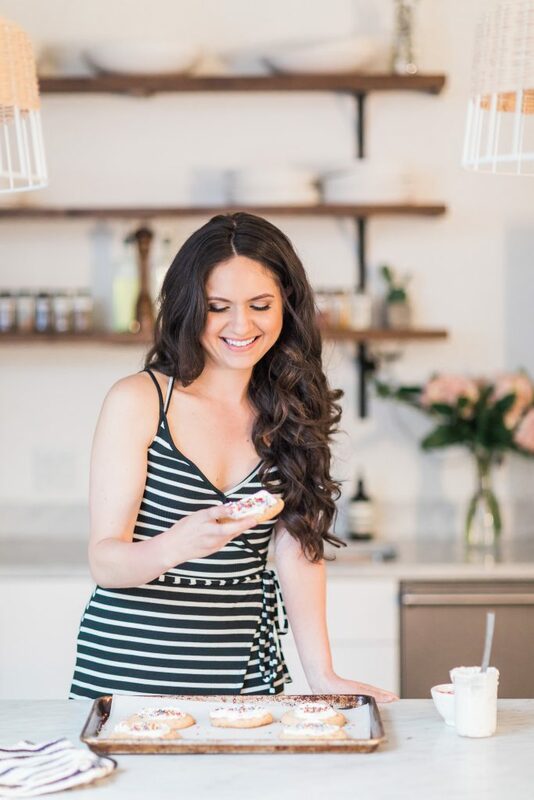 Did you view the recipe on a mobile device or desktop? I’d love to figure out why it’s not showing up! That said, if you forgot it the cheesecake should have still turned out fine. Maybe just a little less creamy. Have you had a chance to taste it yet? One more question: I used a stand mixer with a paddle attachment instead of a blender – is that ok? Oh so delicious. I made this cake today and I could not wait I took a slice before six hours. Thanks for the great recipe. Put the springform pan in a larger cake pan — put that one in the water bath! No layers of aluminum foil, no leakage! Hello! I have made your white chocolate raspberry cheesecake and it always turns out perfectly! 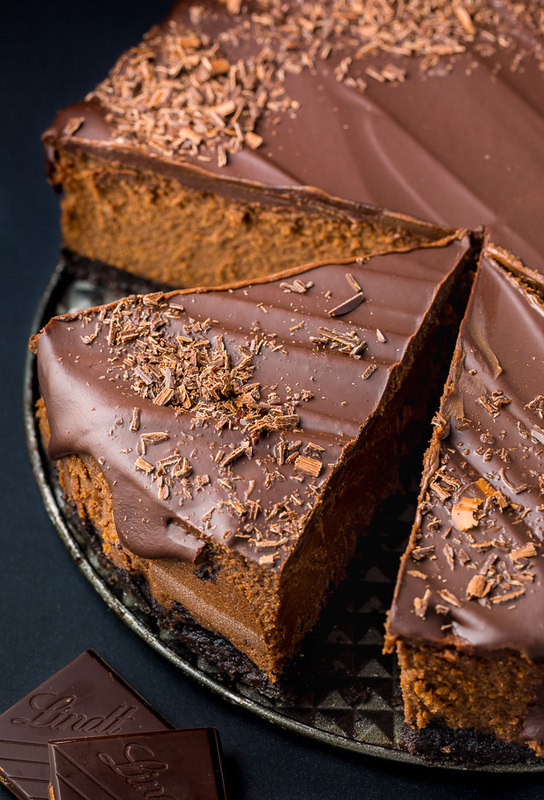 Everyone always asks where I bought it from 😉 I am making this chocolate cheesecake today and trying to adjust the recipe for mini cheesecakes. I just took the first batch out of the oven and they smell amazing but are super lumpy/sunken middle, would you have any tips that could correct this? I kept the oven at 325 and adjusted the timing to 15 minutes and 5 minutes with the oven door open. Thank you! (2) 8 ouce cream cheese it means just 8 or 16 ounce creAm cheess ? This looks so yummy!!! I need this is my life and afterlife. This is probably one of the prettiest cheesecakes I’ve ever seen! I found this via pinterest and just made this for my brother’s birthday, and everyone LOVED it. The mascarpone truly helped it not to be overwhelmingly sweet. Thanks for the delicious recipe! Hi is it necessary to add the two extra egg yolks? Does it not make it too set and is it ok to leave out? Do you have a link for a pan for the water bath? Thank you! 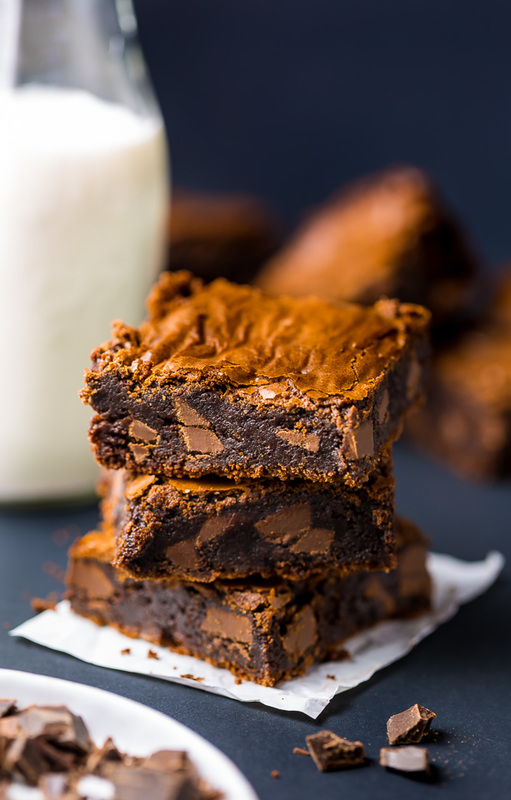 Can I use an electric mixer for this recipe? I don’t have a blender and will have to borrow my neighbor’s food processor for the crust. How do you freeze the whole cheesecake? Thank you for the recipe! Hi Adriana! Simply cool the cheesecake completely, wrap it in multiple layers of saran wrap or aluminum foil, then freeze for up to two months. You’ll need to thaw in the fridge overnight before serving 🙂 P.S. don’t freeze with whipped cream on top.